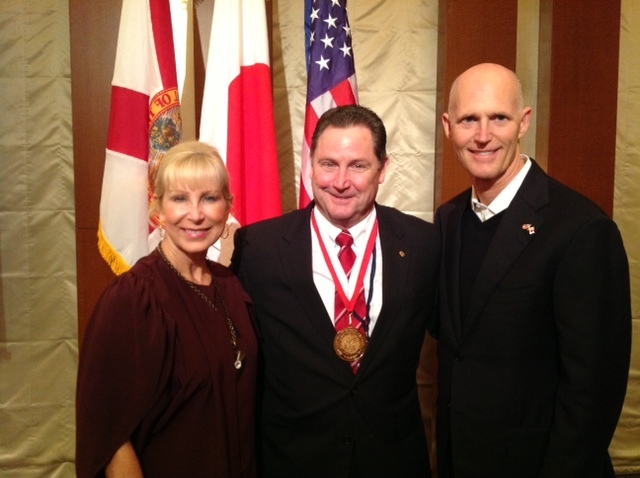 Governor Rick Scott and First Lady Ann Scott yesterday formally welcomed Florida’s Delegation to Japan where they thanked them for attending and promoting Florida as the number one business destination in the United States. During the event, Phillip Brown, Executive Director of the Greater Orlando Aviation Authority, was honored with a Governor’s Business Ambassador Award for his work in building international relationships throughout central Florida and for his efforts to continue to create jobs and opportunities for Florida families. Japan is the number one country that invests in Florida in terms of property, plant and equipment. In 2012, Japanese companies exported $6.7 billion dollars to Florida, an increase of 19 percent over the previous year.